Yesterday, we went to the Bishop Museum where we learned about the rich, vibrant culture of the Hawaiians and how their government was overthrown by the Dole Corporation. Poor Queen Lili'uokalani. We also learned about the two kinds of hula, the origin of the ukelele, and the three social structures within Polynesian cultures. Moxie took a horseback ride and saw sea turtles. Plus there has been so much tropical fruit, oh good golly, the fruit! I had been so sick of the berries, and here I've been eating pineapple, guava, passionfruit, papaya...Then there's fish, chicken, pork, rice (is that still grown here? ), tomatoes, sweet corn, Hawaiian onions, and sea asparagus. I'm ordering wine from Australia and New Zealand, since I figure this is a close as it's ever going to get to local. Keep visiting Flickr for more photos. Posted by Cousin Flora at 10:27 PM 1 comments - Post a comment! I think Hawaii may be the best place on earth. I'm here in Hawaii with my sister, Moxie, and we spent our first full day taking a lovely hike to some falls, getting rained on, eating lunch at a local restaurant on the "best local hole-in-the-wall restaurants" listing, and then washing off the day's mud and sweat with a dip in the ocean. For now, I will just link to some photos. More to come! Posted by Cousin Flora at 11:48 AM 0 comments - Post a comment! We are 13 days into our one-month locavore challenge, although I'd been preparing ahead before we started. To review, our particular locavore challenge is: Washington state grown only in July, with two exemptions, olive oil and coffee. We are also not counting basic dry-good ingredients such as salt, yeast, baking soda & powder, and spices.I figured out where to buy things, ordered Washington-wheat flour from Winthrop, and started practicing my bread-baking skills. Here are some things I’ve learned so far. Lesson #1 - This isn't bad at all. There's lots of great stuff to eat from Washington state. The farmers markets offer a wealth of produce, we can bake our own baked goods, use honey instead of sugar, and eat plenty of meat, eggs and dairy for protein. Lesson #2 - BUT: It would be completely impossible without farmers markets, and the family-run butcher shop in our neighborhood. If we were relying on the local grocery stores - even the ones, like PCC and Whole Foods, that claim to support locally produced food - we'd have no produce whatsoever, and a limited amount of meat and dairy. Lesson #3 - I do not much care for okra. And that's all I'll say about that. Lesson #4 - The perniciousness of sugar and salt: Eating whole foods cooked from scratch reveals just how much sugar and salt we generally eat. Having eliminated sugar, I am going through a 16-ounce jar of honey per week. That includes sweetening my morning coffee every day, as well as up to ¼ cup of honey every time I bake bread. I’d probably be using more in the winter, when we wouldn’t have the sweetness of fresh fruit. Similarly, having eliminated all processed foods I’m really aware of how much less salt we’re eating. Lesson#5 - Good meat is...good! Though historically leaning vegetarian, we’ve been buying high-quality meat from our neighborhood meat market, and I’ve taken to cooking with bacon – good, thick, juicy bacon. I now understand why it has been prized, historically, not only for its keeping power but for the flavor (and salt!) that it adds. Lesson #6 - Baking bread is fun! I’m baking two to three loaves per week. From start to finish, elapsed time is about 4 hours with two rising periods, a bit more with three rising periods, which makes a much lighter bread. I’m getting the hang of it, and I find the old saying is true: kneading bread is soothing. We’ve also tried wheat tortillas once, which were a little heavy but very easy to make, so we’ll do that again soon and hopefully improve. I tried cookies today for the first time - hazelnut shortbread thinghies with whey powder and honey instead of sugar. Lesson #8 - Making yogurt is easy, boiling milk is a pain in the neck: I’ve found all dairy products available locally except for yogurt, for some reason. But I’d heard that yogurt is easy to make. All you need is a quart of milk, and ½ cup of yogurt, to make another quart of yogurt. I'm only about 50-50 on yogurt success so far, for some reason. Unlike bread, this is not something I see myself making from scratch in the long run. Lesson #9 - Bring back Home Ec! I hit middle & high school in the late ‘70s and early ‘80s, when the feminist revolution had exposed the sexism of offering home economics to girls and shop to boys. As a result, we got neither. I didn’t miss it at the time, but now I’m realizing how little I know about the basics of food preparation and preservation. Every week I find myself asking remedial questions like: What’s the difference between blanching and parboiling? Does buttermilk keep longer than regular milk, and if so why? Is it better to freeze berries or can them? Why doesn’t whole wheat rise as well as white? I hope these days young people are getting some kind of education on food. That's the rundown so far. Enrico isn't as enthused about this process as I am, but he's gone with the program so far. I think he misses corn chips most of all. A friend who's a lifelong Washington resident told us he thinks one of the Native tribes grows corn and makes cornmeal, so perhaps that's available after all; more research is in order! Posted by Cousin Flora at 5:55 PM 1 comments - Post a comment! First, a correction: It turns out it is not, in fact, illegal to let your cat roam loose in Seattle, as I recently and incorrectly asserted in my posting on coyotes. The City of Seattle's leash/containment laws apply to all pets except for cats and...pigeons (I kid you not). My apologies for the error, and let me just emphasize that I am sincerely sorry for the loss of anyone's pet cat to a coyote. Please, I do not want hate mail from the cat community, some of whom seem to be quite agitated about this whole coyote situation. I just still think the coyotes are entitled to live here. And that cats are safer indoors anyway - seems to me their demise is more likely to come from a car or a raccoon. Speaking of which, we heard a coyote howl nearby last night. It was cool, I've only heard that sound in the desert of Utah before. Our dogs went absolutely bonkers. I do hope all the neighborhood cats made it through the night unscathed. Second: I had an arborist out today to look at our ailing maple tree, which is apparently suffering from the tree equivalent of congestive heart failure. But the arborist also pointed out that one of the ornamental trees on our property, planted by the previous owner (a landscape architect), is apparently a rare and valued species which we could likely uproot and sell to an enthusiast for something like ten thousand dollars. And in fact, if the tree were smaller and in a more accessible spot, somebody might even steal the tree to sell on the rare-tree black market. Jiminy Christmas, the world is a strange place. Posted by Cousin Flora at 9:49 AM 0 comments - Post a comment! Today the contractors are fixing the carport, as well as the fascia boards and gutters on the house. There is much banging. Nelly does not like this one bit. 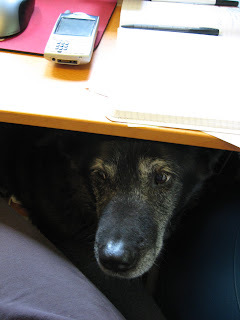 My fearless lioness is hiding under my desk, just as she did through the re-roofing and the re-plumbing. Poor little Woo-Dog. I supposed it doesn't help that the last time somebody banged on the house, they were burglars busting in the front door. Both dogs are jittery. The three of us are very tightly packed in here today. Though some of us are more comfortable than others. Posted by Cousin Flora at 12:34 PM 0 comments - Post a comment! For the past year or so I have been making serious efforts at reducing our footprint on the earth, environmentally speaking. We put in more energy-efficient windows, installed a programmable thermostat, and turned the heat way down at night. I'm on this local food kick, because I've become convinced that more localized food production systems need to be the way of the future. We have almost 100% compact fluorescent light bulbs in the house now. I'm tracking our weekly driving miles and gas mileage, so I can start trying to measurably reduce our gas usage. Because the grocery stores cut the bags, we were buying more plastic bags. But the whole public policy discussion about the bags in the first place made me think about all those poop bags going into the landfill. Is it better to flush our dog's poop, as King County used to suggest? The thought is kinda gross, but I was willing to consider it. Except if we all did that - we, Seattlites, the dog-lovingest city in the nation - the sheer volume of dog poop could overwhelm the waste management systems. And, even if you bring the poop into your house and flush it, you still had to scoop it up in something impermeable - and probably plastic. Thus you have eliminated the poop from the landfill, but not the plastic. So I found, and ordered, 100% compostable and biodegradable "plastic" bags, made from corn. Which is great, and it makes me feel better. But the bags are produced in Denmark, which means they're shipping them all the way over here. How does the incremental amount of fuel used to ship those bags to Seattle compare with the amount of petroleum used to produce and ship a comparable number of regular plastic bags? And how do you weigh the fuel use against the potentially infinite time the regular plastic molecules will circulate in the environment? And then Enrico points out that in landfills, nothing composts or breaks down, because they are huge and capped and there isn't any oxygen. For as long as the landfill holds, neither plastic bag will break down; nor will its remains leach into the environment. But the centuries will go by, and eventually that stuff will get into the earth and the water, right? So since the bag is compostable, and poo eventually breaks down into harmless organic materials, should we dig a compost hole for our dogs' poo on some corner of our property? I mean, people use cow and horse poop for manure all the time. The Seattle Zoo sells the damn stuff to gardners. Armed with our compostable bags, couldn't we just compost our poo? Apparently not, since the aforementioned study posits that the bacteria in dog poo - due to the nature of their diets and their digestive systems - does not break down quite so easily and harmlessly as poo from animals who mostly eat grass. None of this even gets into the question of whether corn production for biofuels and compostable plastic bags is exacerbating the food crisis. I have my doubts about that, or at a minimum I suspect it's a red herring, something that could be addressed if we fix our food production systems, globally, which we need to do anyway. But still. Oy. So what the hell. And this is just one little thing, the poop bags. Magnify it across all of daily life, and the questions, the dilemmas, the tradeoffs, all become overwhelming. The problem is, we as individuals just don't have the tools available to make all the changes that are needed, even if we are fully willing and motivated to give it a go. There are some meta-problems that need to be solved. But will the meta-problems be solved if there aren't individual people clamoring for the solutions? You think this is bad? Don't EVEN get me started on my quest for a new garden shed. Posted by Cousin Flora at 11:00 AM 0 comments - Post a comment! Posted by Cousin Flora at 9:50 AM 0 comments - Post a comment! Toby makes a new friend! On Friday Enrico and I were walking the dogs together, and a block from our house we saw a telephone pole flyer announcing that one of the Seward Park coyotes had been seen on that very intersection, at 5 am a few days earlier. For those not in the loop, at least three coyotes have taken up residence in nearby Seward Park. They have been ranging out at night and have eaten a few pet cats, and attacked at least one little dog. They're not the first coyotes to take up residence in the city. State laws - passed by voter referendum about eight years ago - limit the government's ability to kill or even relocate this kind of wildlife. A friend of ours in another neighborhood told us that when coyotes moved in there, concerned neighbors called a community meeting to complain about their disappearing pet cats. To which the city said - hey, if you're letting your cat roam loose, you're breaking the law. Keep the kitty inside; problem solved. In fact, my cursory web research on coyotes revealed that they're extremely common in cities, and one study estimated something like 2,000 of them in Chicago, for heaven's sake. Enrico and I are generally pleased whenever the wild animals reclaim a little of what humans have taken from them, and we live in hope that we might one day coexist in more peaceable harmony with all the flora and fauna. Plus we're generally fans of the whole canine genus, from the tame ones in our own house to the majestic wolves and coyotes who have been so ruthlessly demonized and hunted. So we're pretty excited about our new neighbors. I asked Enrico if this would change his behavior when walking the dogs through Seward Park. 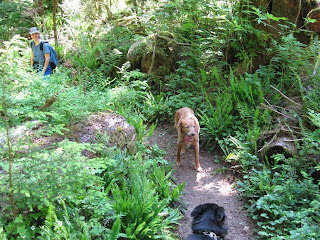 He likes to take them over the top, on the trails through the wooded areas, where he lets Toby run off-leash. Yes, we know it's illegal, but it's quiet and woodsy up there, and lots of people do it. Enrico figured coyotes are wary of people and would be laying low during the day. The odds of encountering one seemed pretty unlikely. So the very next day - yesterday - he toddled off to the park with the dogs, and whom should they meet, but - a coyote! Toby took off like a shot after his distant cousin, Canis Latrens. Enrico called him back, and the coyote returned shortly thereafter. As Enrico leashed Toby up, the coyote began making a sound which Enrico could only describe as a high-pitched "scolding." The scolding continued for a sustained couple of minutes as Enrico high-tailed it down the hill with the dogs. 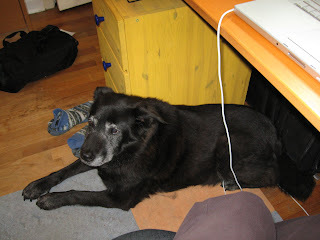 So, there will be no more off-leashing for Toby in Seward Park. It's somebody else's home now, and that must be respected. I hope the coyotes get enough to eat there. My guess is that the population of rabbits - pet bunnies unwisely released into the wild by their owners, along with many generations of offspring - are goners. Which is ok with me, since they really shouldn't be there. I wonder if we can also thank our new canine neighbors for the puzzling absence of rats over the last few months. Anyway, there is a community workshop on "Coexisting with Coyotes" on Tuesday night at the Pritchard Beach Bathhouse; I think we'll go to learn more. Posted by Cousin Flora at 10:26 AM 0 comments - Post a comment! We are four days into our real experiment with locavorism. As I mentioned, it seemed like we were already well underway because I'd been researching food sources, stocking up, and practicing recipes for the things we'd need to prepare from scratch. The diversity of produce available at the farmers markets expanded greatly just this week. I even have tomatoes - tomatoes! They are hothouse, but very local. Although local dairy products are not a problem, the one thing I haven't found is yogurt. We can get yogurt from Oregon cows, or California, but not Washington. But my trusty book* told me that yogurt is very easy to make. All you need is milk and...more yogurt. I tried my first batch this week, and it was a flop. It separated into liquid whey and, well, whatever else there is in milk when you take out the whey. Upon re-reading the instructions, I noticed the firm admonition to only use very fresh ingredients. Since I'd scraped the bottom of a yogurt tub that had been open for two weeks to get my yogurt starter, I figured this was my problem. So I tried again, and this time it came out beautifully. It is indeed very simple, except for the fact that you have to heat the milk to boiling, and of course that takes some care. Then you have to let it cool to a very precise temperature before putting in the starter yogurt. So it doesn't take a lot of work, but it takes a lot of attention while you're doing it. So, add yogurt-making to bread-baking, steam-juicing and canning, on my list of newly developed skills. Speaking of juicing, I finally managed to extract a full half-gallon jug of juice. It took somewhere between 4 and 5 pounds of fruit. Meanwhile, our strawberry patch is going nuts, producing way more strawberries than we can keep up with. I have no desire to freeze the excess since local frozen berries of all kinds are abundantly available here in winter. So I decided to take a bunch to our friends on 4th of July, as part of our food contribution. The strawberries were so ripe that I didn't think they'd keep even two more days, so I cooked them down slightly with some honey and a bit of (local) apple cider vinegar. I'll bake a loaf of fresh bread, too, and probably take the juice. 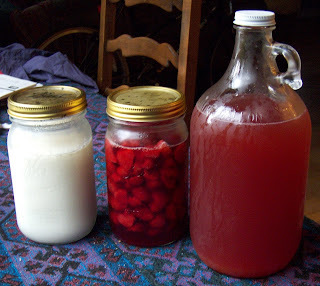 * Stocking Up, by Carol Hupping, which covers things like canning, drying, freezing, making dairy products, baking bread, preserving meat and - I kid you not - storing food underground for the winter. It's like a pioneer woman's survival guide. Posted by Cousin Flora at 9:04 AM 0 comments - Post a comment! A couple of weeks ago I saw this article in the paper, about a church group that has started a small farm with the goal of developing a farmers market in the Central Area of Seattle, one of the few neighborhoods that does not yet have a market. It's also the predominantly African-American part of town, and so the organizers of this effort also want to do it in a way that will keep the business dollars in the black community. Unfortunately, for various reasons they were going to have to move their plant starts to a new farm location, and were calling for volunteers to help re-plant. So we headed down there on a Saturday morning, and spent about four hours helping out. There were probably a couple dozen people from the church, and maybe 75 additional random volunteers like us. Some of the plant starts were still in trays, but others had been pulled from the ground and were heaped in buckets. These latter needed to be replanted very quickly, before disintegrating into green goo, like the old lettuce at the bottom of the plastic bag. I mostly planted, and Enrico mostly hauled bucket after bucket of fertilizer (manure) to the newly turned beds. After four hours, my legs hurt so badly from squatting, I was pretty sure I'd be walking like a duck forever. My lower back was screaming. 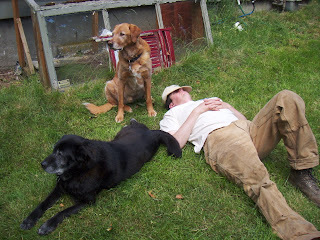 When we got home, Enrico did not even make it into the house before falling asleep...in the back yard. He literally couldn't get through the door without sleeping. The only thing that got me in the house was the desire to shower the manure off. After just four hours. This is how hard it is to be a farmer. I am that much more appreciative of these people now every time I go to the farmers market. 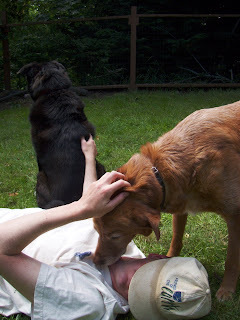 The dogs were appreciative that Enrico was acting like a proper dog and lounging in the grass with them. Finally! they said, you are getting with the program around here. And the smell of manure was a big plus, too. Posted by Cousin Flora at 9:13 AM 2 comments - Post a comment! 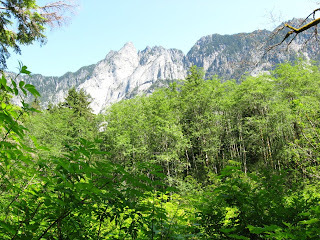 On Sunday we went hiking, our first warm-weather hike of the season. We had our last blizzard in the mountains just three weeks ago, the gem in the crown of our coldest-June-on-record. But then suddenly the temperatures shot up into the 90s this weekend. So we headed out into the woods. 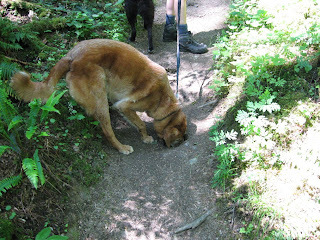 When we take the dogs out for their first warm-weather hike of the summer, we always notice a distinct drop in their stamina from the previous year. Enrico still takes the dogs out to the woods all winter long in the snow, and although they are generally slowing down with age, they do better in cooler weather. Then summer comes, and each year we see a marked drop in their heat tolerance. 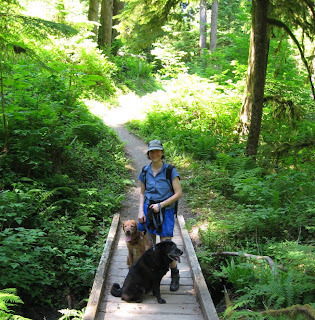 It started a few years ago on a hot, steep, dry trail, when they both just pulled over into a shady spot along the trail and laid down. This might sound like a perfectly sensible response to feeling hot, but it was unprecedented. Up until that point, the dogs' response to being somewhere fun was always, ALWAYS, to keep moving. Because as fun as this is right now? There could be something even better right around the corner! So in deference to their advancing years, we starting limiting ourselves to cool, shady trails with abundant water. One year Toby started diving under the shade of the car at the end of a hike to cool off, and Nelly needed a lift into the car. In his youth, Toby would run madly up and down the trail for the whole hike, covering at least three times the distance of the rest of us, with a grace and speed to rival the cheetahs on the animal channel. But at some point he was content just to dash ahead and wait for us. We'd round a bend and there he'd be, happily surveying the woods as our scout, catching his breath before the next sprint. 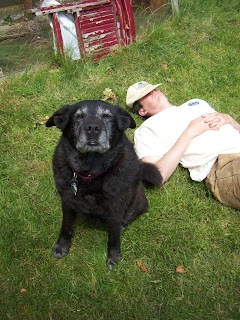 Now, in his 11th year, he ambles along with me, so sedately that I sometimes forget to take him off leash. This year we noticed Toby's increased interest in the various holes and burrows created by the woodland residents. Animals create lots of hidey-holes in the woods - in the ground, in old tree logs, in tree roots, between the boulders of rock fields. Toby never seemed to notice them much before, probably because he was blasting by them at high speed. But now that he's moving more slowly, he notices and investigates. 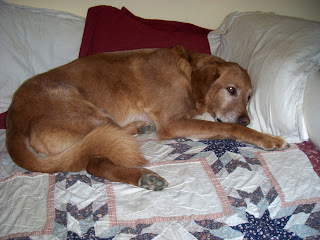 I halfheartedly warn him that one of these days he might stick his nose somewhere he regrets, like into a hornet's nest. But he doesn't care. We consider Toby to be a role model - for his relentless enthusiasm for life, his boundless love, his spirit of optimism and forgiveness. There's a lot to admire there. And now, as he enters a slower, more reflective phase of his life, he reminds us of yet another important lesson: To remember to pause along the trail of life, to stop and smell the hidey-holes. Posted by Cousin Flora at 7:15 AM 0 comments - Post a comment!